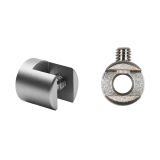 Standoff fixings are aluminium mounts that screw to your wall or ceiling to allow you to attach an acrylic sign, either through holes drilled in the corners or by gripping the edge or sides of the acrylic. 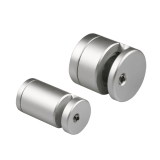 Standoff fixings look very professional and stylish, yet are actually very inexpensive to buy. How do you use acrylic standoffs? The body of the acrylic standoff needs to be screwed to your wall first. Once in place, you simply put your acrylic between the edges of the standoff fixing and tighten the grip to hold the acrylic securely in place. How do I add my artwork or text? There are two ways to add your text or artwork to an acrylic standoff sign. The most common way is to use two sheets of acrylic and sandwich your paper poster between the two and then attach these to your standoff. Alternatively, for smaller signs and high-end, permanent designs we can have your text or artwork professionally printed directly onto a single acrylic sheets. Do I need to make my own acrylic standoff signs? We sell the components to allow you to make your own signs but also stock a wide range of acrylic standoff sign kits, ranging from poster holders, office and door signs to high-end acrylic standoff signs with the print directly on the acrylic - these look amazing! Do I need drilled acrylic when using sign standoffs? 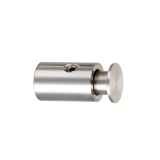 While some of our sign standoffs do require holes of the right size drilled in the acrylic panels we also produce edge standoffs that grip the edges of the panels. Edge standoffs don't require any drilling, so all you need to create an acrylic standoff sign are 2-4 edge standoffs and 1-2 sheets of acrylic. What styles of acrylic standoff are available? Acrylic standoffs come in three main types: through-hole, edge or side-grip. Through-hole standoffs are attached to the wall and the acrylic sheets sit onto the standoffs via holes drilled in the acrylic sheet. Edge standoffs are attached to the wall and grip the sides of the acrylic panel, without the need to drill any holes, while side-grip standoffs attach to either the wall or ceiling and attach to just one side of the sign to hold it out at 90° rather than holding it against the wall. What size picture standoffs should I use? Picture standoffs generally look best when their size is in proportion to the acrylic being displayed, so larger acrylic sheets tend to look better with bigger standoffs. We make our standoffs in a wide range of sizes and colours to suit the look you're trying to achieve.